Left to Right:*Fairy Dew Cap, Spring Fairy Flower, Forest Breeze Vest;*Clover Earrings, Leafy Love Outfit (M), Dinofrog, Jade Monarch;*Green Ribbon Hairband, Green Shutter Shades, Dinofrog Outfit, Dinofrog Gloves, Dinofrog Shoes;*Green Leaf Hat, Green Leaf Overall, Green Leaf Shoes. Left to Right:*Lime Green Sun Cap, Forest Breeze Nightgown, Emerald Dragonfly Wings;*Maple Green Beret, Green Overall Shorts, Green Apple Word Bubble Ring, Green Apple Label Ring;*Green Picnic Hat, Blooming Leafy Love Outfit, Green Rain Boots;*Dinosaur Snapback, Vintage Hoodie Jacket, Slime Slippers. You can see all the rewards rates for St. Patrick's Day Surprise Style Boxes*here. Double Miracle Time is coming back, with double the rates of a rank up! Save your cubes for*Saturday, March 16, 2019*and a chance to raise your rare equipment's rank TWICE with one cube! Get geometric with these adorable*Cube pets! Choose between a*Cube Puppy,*Cube Kitty, or a*Cube Hamster. *The individual pet packages come with an equip to wear, yummy pet food to eat, a Pet Name Tag, and some useful pet skills and scrolls. Bring these adorable*Cube pets*pets along for*your journeys in Reboot World! Give your new Cube pets*a cute cube balloon to carry around with these*permanent pet equips! Channel your powers of telekinesis! 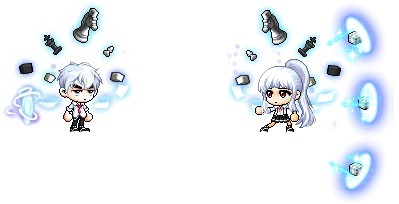 Pick up a package containing a*permanent outfit that lets you look just like Kinesis! The Great Gachapierrot has added lots of new items! Pick up the new Nightmare Seesaw,*Leaf Umbrella Chair, and*Intergalactic Planetary Cat! 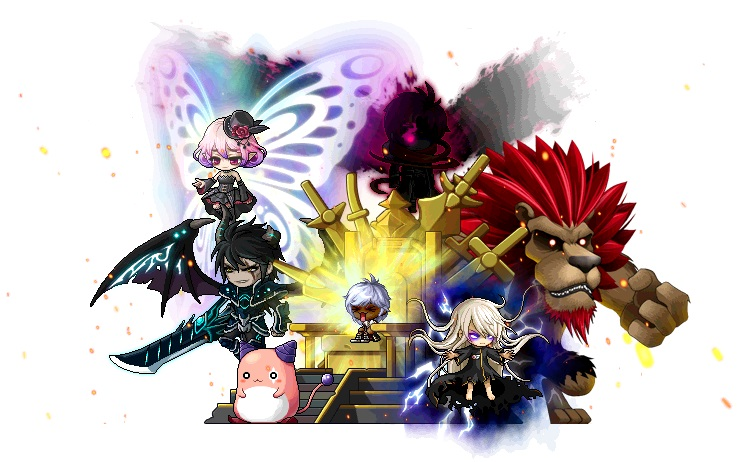 Take a seat on the Secret Flower Garden Chair,*Carrot Chair,*Chick Keeper Chair, and*Lucid's Nightmare Bed! Watch your Ambition grow with the*King of Ambition Chair! As your Ambition levels up to 25\%, 50\%, 75\%, and 100\%, the chair becomes fancier. Enjoy the Hawalu Chair,*Diabolical Chair,*Rainy Pal Chair, and*Sky Lantern Chair! Get cozy on the Down Home Family Chair,*Arcana's Spirit Chair,*Sheep Shearing Chair, and*Chicken Dream Chair! Hop on the*Animal Crystal Ball Chair, and join the M-Forcers with the Red Mesodizer, Black Mesodizer, Pink Mesodizer, Blue Mesodizer, Green Mesodizer, and Yellow Mesodizer. When you and five friends each sit on one of these chairs near each other, you can form the robot Mesotron-X! Take flight with the new Lucid Wings Mount, as well as returning mounts like the*Devil Lucifer Mount*and*Wind Breaker Mount! *These mounts are all available as permanent versions. Get ready to ride with the Flying Blue Sheep Mount,*Flying Pink Sheep Mount, Moon and Stars Mount,*Bouncy Deer Mount, and*Wind-up Chicken Mount! *These mounts are all available as permanent versions. Hop on the Vroom Vroom Pink Bean Mount, Giant Rooster Mount,*Honey Cat Mount, Beyond the Rainbow Mount, and*Music to my Feet Mount! *These mounts are all available as permanent versions. New mounts have also come to Andersen's Box! Get*the*Lucid Wings Mount,*Devil Lucifer Mount,*Wind Breaker Mount,*Flying Blue Sheep Mount,*Flying Pink Sheep Mount,*Moon and Stars Mount,*Bouncy Deer Mount, Wind-up Chicken Mount,**Vroom Vroom Pink Bean Mount,*Giant Rooster Mount,*Honey Cat Mount,*Beyond the Rainbow Mount, and*Music to my Feet Mount! These mounts are all available as 90-day versions. For a limited time, you can pick up a special Gachapon package that contains Maple Stamps! You can use your Maple Stamps to purchase new items including mounts, outfits, chairs, and more! See the list above. [Updated March 14] In the Royal Style section, the incorrect image was displayed for Pure Nostalgia Face (F). This has been updated.